When visiting https://meta.m.wikimedia.org/w/index.php?title=User:Thiemo_M%C3%A4ttig_(WMDE)&mobileaction=toggle_view_mobile or https://en.m.wikipedia.org/w/index.php?title=User:Iniquity/sandbox&mobileaction=toggle_view_mobile the box appears unstyled. It is ResourceLoader problem: mobile version switch off by default. We should limit the floating and fixed width styles to deviceWidthTablet and make font size relative to containing element and enable them. Please can we take the time to make this task more readable to others? What is the URL of the page you do not need the styles on? How does it look (can you post a screenshot)? How does not loading the css break the page? Thanks for update! 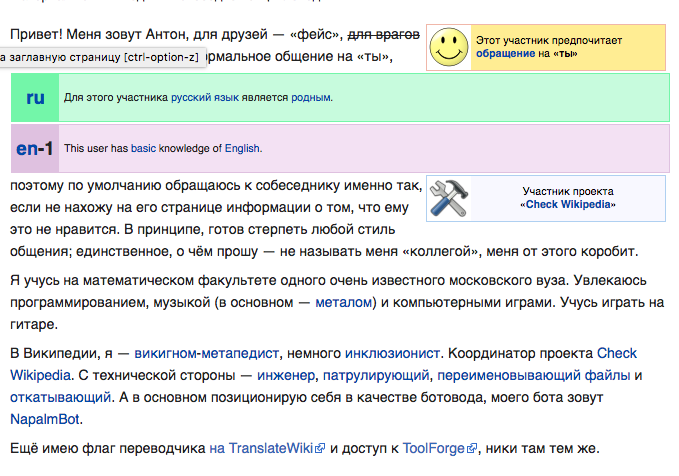 :) But I think we need to stick to the style (floating) of other wikimedia's userboxes. Sure but let's not enable something broke. The whole point of the targets system is to revise styles for mobile before enabling them. Luckily this one looks trivial as it just involves restricting certain styles inside media queries! Yay! If we use this breakpoint only for min-device-width than we will have the same problem with landscape orientation: boxes will be really long. I think the proposed patch is a big improvement and I'd like to see us iterate off of it rather than leave things in the broken state. A rebase and correcting the version number would be enough for me to merge it. As a next step we'll probably want to get the media queries working on desktop resolutions, ideally through rewriting babel as a non-table based layout. @Jdlrobson I have changed something because of !important ban, can you look it again?